Facebook is seriously ramping up its efforts to win over journalists, who tend to rely more on Twitter as a news source. After expanding access to its Mentions app and launching Signal for journalists, the company has partnered with CNN to demonstrate how powerful live-streaming news through its platform can be. The partnership is officially kicking off with the US Democratic presidential debate this evening (8:30PM EST), and will continue as the news outlet live-streams associated content. CNN is the first media company to gain access to this feature on the Mentions app. 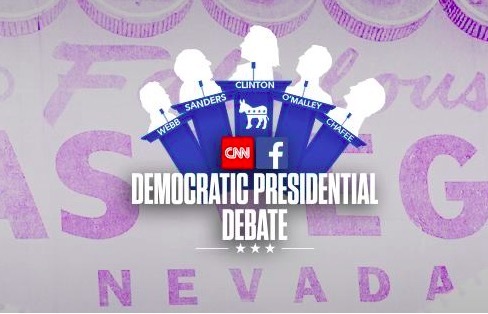 In the Facebook lounge at #DemDebate – what questions do you have for John Berman Chris Moody and Maeve Reston ? Facebook hasn’t had much success when it comes to rivalling Twitter as a news source. If you open a selection of random articles on any news website or blog, you are sure to find far more embedded Tweets than Facebook posts. When Twitter acquired Periscope, it cemented its position as an all-round tool for journalists and has been successful thus far. Publishers can take advantage of live-streaming big news with a platform built right into Facebook, which is a significant efficiency advantage compared to rival Twitter. Opening Mentions up to international news outlets with a huge following is something Facebook needs to tread carefully about. At the moment, Mentions is only available to an approved group of users, such as journalists and celebrities, so there isn’t an abundance of live content showing up on news feeds generally. If a large number of news organizations were to start live-streaming video throughout the day, news feeds could become very busy and unappealing. That being said, it could also be a great move, as publishers would get to interact more with users on Facebook in real time, which will be a draw away from Twitter. Whether it will replace it or just become an additional tool remains to be seen. Tonight’s debate will be the real test as old and new media meet – CNN has the TV boxed off, while Facebook will be pulling in viewers online. The television network has said it will be working with the social network in real time to gather data and gauge viewers’ reactions during the debate. CNN anchor Don Lemon will also select questions submitted through Facebook and ask them to the candidates during the debate. This evening’s debate is part of a partnership that will continue through the primary season and will be the first of many co-branded debates between the two media giants. Looking at CNN’s first foray into live-streaming on Facebook this afternoon, it has had 53,000 views so far and even the presenter – Chris Moody, CNN’s senior digital correspondent for politics – had a fumble and had to re-do his introduction live, so it’s going to take some getting used to for everyone.